Description: The feelThere/Wilco Caravan is by far one of the best things that I have ever gotten. 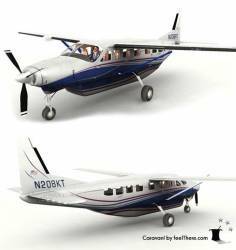 It is so much more realistic than the default Cessna Caravan and me being a Caravan lover that means a lot. I especially enjoy the realism involved in the radio stacks and the Virtual Cockpit. The GPS is actually in the Virtual Cockpit, and the radio stacks are on the GPS which is so much more realistic. The start up procedures could be a little bit better but I would still say that they are okay.I also enjoy the detail put into the aircraft for instance, after I am airborne the wheels turn due to wind. If you move the Prop Control Lever the prop actually moves. One thing that I do have problems with are the add-on liveries. Once I download them from the Wilco site they don't work. The 2D panel goes away and the Virtual Cockpit doesn't work either.